On September 11, 2001, terrorists crashed Flight 77 into the Pentagon, killing the 59 passengers on board the aircraft and 125 military and civilian personnel who were working inside the Pentagon. 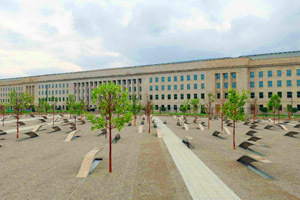 Shortly after the attack, the United States Congress authorized the Secretary of Defense to create a permanent memorial on the grounds of the Pentagon. The Pentagon Memorial park consists of 184 memorial units, each of which are dedicated to an individual victim by its unique placement within the collective field. The field is organized as a timeline of the victims' ages, spanning from the youngest, three-year-old Dana Falkenberg, to the oldest, 71-year-old John D. Yamnicky. Each memorial unit is located on its respective age line-thin metal strips that cross the memorial park. This ordering develops a powerful understanding of the broad range of the lives lost, from the youngest child to the oldest adult. The "terrazzo" finish of each memorial unit rises dramatically from the ground on one end, and on the other end hovers over a small pool of lighted water in the surrounding gravel field of the park. Each unit has a specific directionality to distinguish victims on board Flight 77 from victims within the Pentagon. The memorial units representing the 59 lives lost on Flight 77 face so that when reading the name of the victim to whom that unit is dedicated, the visitor to the memorial park faces the sky. When standing at a memorial unit dedicated to a victim who was inside the Pentagon, the visitor will see the victim's name and the Pentagon in the same view. The simple but elegant memorial units are at once a glowing light pool, a cantilevered bench and a place for permanent inscription of each victim's name. The interplay between the leaves of surrounding maple trees, light, bark, footpath gravel, grasses, water and the senses provides an experience in the park that is touching and moving, one that creates a place of peace and remembrance, and allows for individual interpretation by each visitor. The Pentagon Memorial, therefore, serves a much greater purpose than just remembering the 184 people who were killed that day. This memorial provides a place for future generations to remember and reflect on September 11, and its significance for us and our nation. This memorial is a place of solace where visitors can renew their faith in, and commitment to the values that we all share.